The first attempted orbital launch from Hawaii failed this evening. The U.S. Air Force-led Operationally Responsive Space mission, ORS-4, launched the islands’ first space-bound rocket from the U.S. Navy’s Pacific Missile Range Facility at Barking Sands on Kauai shortly before 6 p.m. The SuperStrypi rocket was an experimental launch vehicle designed to provide a new, low-cost space launch platform. It’s main payload was a University of Hawaii hyperspectral imaging camera, but it was also carrying 12 other satellites. It should have taken only 13 minutes to reach orbital insertion, but about a minute into the launch, things appeared to fall apart. The ORS-4 mission on an experimental Super Strypi launch vehicle failed in mid-flight shortly after liftoff at 5:45 p.m. Hawaii Standard Time (7:45 p.m. PST; 10:45 p.m. EST) today from the Pacific Missile Range Facility off Barking Sands, Kauai, Hawaii. Additional information will be released as it becomes available. The test motor showed a burn-through of insulation lining the case, however, the first stage of the first Super Strypi had already been built to the specifications found to be susceptible to this burn-through condition. The issue could be easily fixed on new production motors, but the existing LEO-46 for the ORS-4 mission could not be repaired. A risk assessment was conducted and all parties agreed to accept the added risk to this mission and go ahead with the first stage as is. This decision was made because the burn-through on the test motor did not compromise the motor case itself. The highest risk of burn-through occurs in the closing seconds of the first stage burn. The mission was again delayed last week from an Oct. 29 launch date, which coincided with a Government Accountability Office report that questioned the Defense Department’s progress on “responsive launch” capabilities. Whatever happened, it’s a painful setback for the ORS program, which was developing the SuperStrypi and its rail launcher system to get up to 300 kilograms of payload into space for under $20 million. 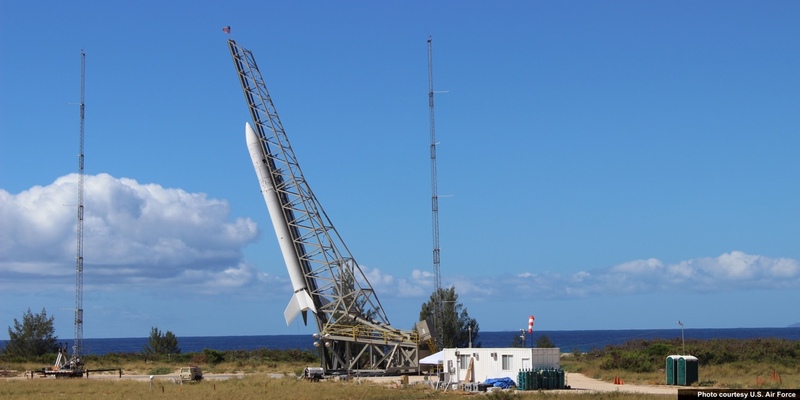 The U.S. Air Force was working with the University of Hawaii, which handled payload development and project management of the rail launcher and launch pad. Other partners included the PMRF, Sandia National Laboratories and Aerojet Rocketdyne Corp. In addition to the university’s 55-kilogram HiakaSat camera, the lost rocket was also carrying instruments from Montana State University, St. Louis University, Utah State University, NASA, and Pumpkin Inc.
“The University of Hawaii is pleased to support the State of Hawaii in becoming a low-cost gateway to space and to provide our students with real-world experience that will be invaluable as we train Hawaii’s aerospace workforce,” UH President David Lassner said in the release. And despite today’s setback, I hope this work continues. Despite the vehicle issue, the project is still a tremendous success for University of Hawaii. About 150 students worked on the payload, a hyperspectral imager called HiakaSat. All milestones for the payload were met and the students received real-world aerospace experience in building a sophisticated satellite. Because of this project, there is now a rocket launch pad and rail launcher in place at Pacific Missle Range Facility and those assets performed well today. There are also tracking stations in place at Kauaʻi Community College and Honolulu Community College that are fielding requests for services from commercial agencies. UH students at multiple campuses, including the community colleges, are currently working on payloads for future space launches. Hawaii and University of Hawaii are now considered players in the aerospace industry and this launch is just the start of launches from the 50th state. Images courtesy Mason Weitzel and U.S. Air Force.